Leonard Walter Jerome (November 3, 1817 – March 3, 1891) was a financier in Brooklyn, New York, and the maternal grandfather of Winston Churchill. Leonard Jerome was born in Pompey in Onondaga County, New York, on November 3, 1817. He was one of nine boys and one daughter born to Aurora (née Murray) Jerome (1785–1867) and Isaac Jerome (1786–1866). Isaac was a descendant of Timothy Jerome, a French Huguenot immigrant who arrived in the New York Colony in 1717. Jerome was born on a farm in the Central New York town of Pompey, near Syracuse. His paternal grandmother was Betsy Ball, a relative of George Washington. He originally enrolled in Princeton University, then known as the College of New Jersey (where two of his brothers studied theology and became Presbyterian ministers), as a member of the Class of 1839, before leaving for Union College, where he studied law with his uncle, known as Judge Jerome, and set up a practice in Rochester, New York. He later moved to New York City, where he became a stock speculator and promoter. Jerome was a flamboyant and successful stock speculator. He made and lost several fortunes, and was known as "The King of Wall Street". He held interests in several railroad companies and was often a partner in the deals of Cornelius Vanderbilt. He was a patron of the arts, and joined in the founding of the Academy of Music, one of New York City's earliest opera houses. During the New York Draft Riots, Jerome defended the New York Times office building with a Gatling Gun. Although he had significant holdings in the Times, he was not the majority shareholder as is sometimes erroneously claimed. The Jerome Mansion, on the corner of Madison Avenue and 26th Street, had a six-hundred-seat theatre, a breakfast room which seated seventy people, a ballroom of white and gold with champagne- and cologne-spouting fountains, and a view of Madison Square Park. It was later sold and housed a series of private clubs. The mansion was demolished in 1967. Jerome was an avid sportsman. 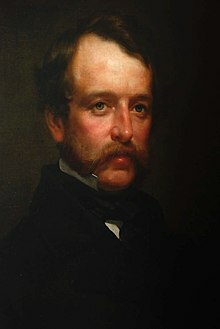 He enjoyed yachting with his friend, William K. Vanderbilt. They shared a passion for thoroughbred horse racing and helped found the American Jockey Club. In the late 1860s, Jerome was part of several hunting trips in the American West. These trips were guided by Buffalo Bill Cody. In 1866, Jerome bought the estate and mansion of James Bathgate near Old Fordham Village in what was then rural Westchester County, but is now The Bronx. Jerome and financier August Belmont, Sr. built Jerome Park Racetrack on the Bathgate land; the first Belmont Stakes was held there in 1867. Jerome and his brother Lawrence had a wide boulevard made from Macombs Dam to the track, which city authorities attempted to name "Murphy Avenue" after a local politician. This incensed Jerome's wife so much that she had bronze plaques saying "Jerome Avenue" made up and bolted into place along the road, forcing the city to accept the name. The racetrack was acquired and demolished by the city in 1894, to make way for Jerome Park Reservoir. The Bathgate mansion served as a summer home for the Jerome family. In the early 1900s, the mansion was razed and replaced by the Kingsbridge Armory. Jerome became a resident of Brooklyn. He, Vanderbilt, and other investors founded the Coney Island Jockey Club which in 1884 built the Sheepshead Bay Race Track. Lady Randolph Churchill (née Jeanette Jerome; known as Jennie), who married Lord Randolph Churchill (1849–1895), younger son of the Duke of Marlborough, and was mother to Winston Churchill and John Strange Spencer-Churchill. Clarita Frewen (née Clarita Jerome), known as Clara, who married Moreton Frewen (1853–1924), fifth son of Thomas Frewen MP, a charming spendthrift who ran up huge debts trying to operate a ranch in Wyoming, and through gambling, sports, and women. They had two sons, Hugh and Oswald, and one daughter, Clare Sheridan. Leonie, Lady Leslie (née Leonie Jerome), who married Sir John Leslie (1857–1944), an Irish baronet, whose family estates covered 70,000 acres (280 km2). They had four sons. For many years, she maintained a liaison with Prince Arthur, Duke of Connaught and Strathearn. Jerome was also rumored to be the father of the American opera singer Minnie Hauk. He also had an affair in the 1860s with Fanny Ronalds, then separated from her husband. Ronalds later lived in London, where she remained a friend of Jerome's daughter Jennie. Leonard Jerome died at the age of 73 in Brighton, England, surrounded by his wife and surviving daughters. He was originally buried at Kensal Green Cemetery in England, and later buried in the Green-Wood Cemetery in Brooklyn. Jerome Avenue in the Bronx, Jerome Avenue in Brooklyn, Jerome Park Reservoir, and the Jerome Stakes are all named after him. ^ a b c d e "LEONARD W. JEROME DEAD THE END CAME QUIETLY AT BRIGHTON TUESDAY NIGHT. A CAREER OF PROMINENCE IN FINANCIAL, PATRIOTIC, TURF, AND YACHTING CIRCLES, AS WELL AS IN NEW-YORK'S SOCIAL LIFE" (PDF). The New York Times. March 5, 1891. Retrieved August 15, 2018. ^ Baker, Kevin, "Violent City: A Five-day Battle for New York Reveals the Birthing Pains of Our Democracy", American Heritage Magazine, February/March 2003, Volume 54, Issue 1. ^ Burrows & Wallace, p. 890. ^ Burrows & Wallace, p. 960. ^ a b Burrows & Wallace, p. 954. ^ "Mrs. Leonard W. Jerome Dead" (PDF). The New York Times. April 3, 1895. Retrieved August 15, 2018. ^ "MRS. LEONARD JEROME'S FUNERAL A Semi-Choral Service Attended by Distinguished Persons" (PDF). The New York Times. April 6, 1895. Retrieved August 15, 2018. ^ Anne Sebba, American Jennie, Norton, 2008, p. 13. ^ Ainger, Michael (2002). Gilbert and Sullivan – A Dual Biography. Oxford: Oxford University Press. p. 129. ISBN 0-19-514769-3. ^ "LEONARD W. JEROME'S FUNERAL" (PDF). The New York Times. March 7, 1891. Retrieved August 15, 2018. ^ "HIS FRIENDS FEEL AGGRIEVED. THEY THINK MR. JEROME SHOULD HAVE HAD A NEW-YORK FUNERAL" (PDF). The New York Times. September 6, 1891. Retrieved August 15, 2018. This page was last edited on 28 February 2019, at 13:06 (UTC).